Why do eye injuries still happen? I believe the injuries can be traced to gaps in protection. These gaps are the result of safety glasses that are out of position, eye protection which does not fit snuggly against the facial features, side shields missing or used on dress eyewear, and uncomfortable frames are not worn continuously. Safety glasses are removed regularly throughout the work day for the lenses become more soiled from perspiration and environmental debris. If the safety glasses are removed with one hand as is common practice the frame gradually becomes loose and out of alignment: gap in protection occurs. 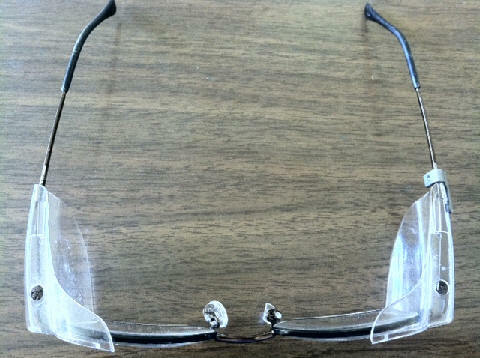 Example A above is an actual prescription safety frame well out of standard adjustment/alignment and illustrates when worn will have openings for debris and splashes to enter the eye. The broken nose pad on the right only adds to improper fit but also interferes with the prescription accuracy. And definitely is uncomfortable to wear for 8 hours. 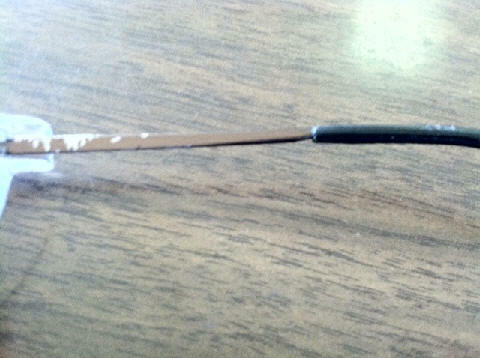 Example B is an actual metal safety frame whose surface has been worn off due to age. In my experience as a standard nickel metal frame enters it's third year it is not uncommon for the finish to lose it's integrity. The finish will actually become "sandpaper" rough and can irritate the skin as the frame is worn. Eyewear which irritates is removed more often and it's not in the break room but in the work environment: gap in protection occurs. One size fits all non-prescription safety eyewear is designed to fit an average adult. But as this chart points out; today's workforce is diverse and what fits an average US male and female is not going to be properly secure for either whose origins are from Mexico or India. If one size fits all Plano eyewear is worn over dress eyewear protection gaps increase not to mention raise the issue of "comfort"
have your employees visit with us whenever we are on site so their eyewear can be properly adjusted and realigned.